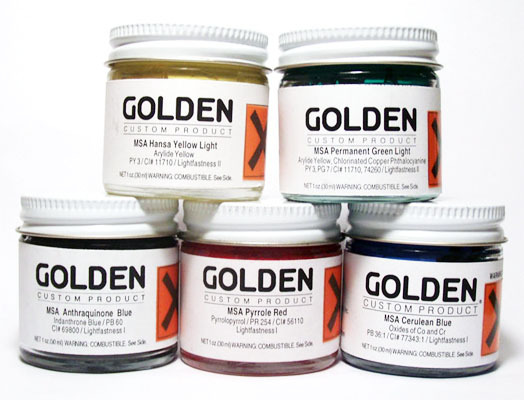 Golden's Mineral Spirit Acrylic (MSA) Restoration Colors are produced from a mineral spirit-borne acrylic (n-butyl methacrylate) resin system. MSA colors dry quickly without color change to form a durable film with excellent chemical resistance to acids/alkalis, water and ultraviolet light. All pigments used in Golden's MSA Colors, both natural and synthetic, are chosen for their greatest purity and permanency within each chemical class. The colors remain soluble in most chlorinated and aliphatic hydrocarbon solvents. Golden MSA Color selection is exceptional! They are available in 58 colors and are packed in 1, 4 and 16 fluid ounce glass containers. When you buy a set of 58 colors you will save an additional 5% off our already discounted prices.